People are deeply influenced by MS Outlook email application because they are associating above depicted parameters with the email application. Microsoft Outlook started its journey from Outlook for MS-DOS and reached to the most robust and intelligent MS Outlook 2016 version. MS Outlook is bundled with MS Exchange Server technology for offering extraordinary email, calendaring, task scheduling, contact management services, etc. It provides two most useful email formats, i.e. Outlook Data File (.pst) and Offline Outlook Data File (.ost) which eases the access to emails either from Exchange Server, Standalone machine, or both. Out of these two files, Offline storage facility creates the replica of email items stored on Exchange mailboxes on local machine. The idea behind creating a look-alike OST email items on local machine is to provide uninterrupted email accessibility in times of Exchange Server disconnection. However, automatic creation of OST folders on your hard-drive sometimes proves to be a disadvantageous as unexpected requirement occurs to save OST backups in a different drive partition or a hard disk. If you really want to change the default location of an OST file, then you can do so by using the MS Outlook email client. However, one must take careful steps while changing the location of OST as it has been seen that MS Outlook shows unpredictable behavior such as freezing of application and malfunctioning Outlook browse button, etc. which puts the OST email items under the scanner of corruption. Let us get acquainted with the OST file relocation process. Close the MS Outlook email client. Click Start → Control Panel or Press the Windows key, type Control Panel, and then press Enter. Double-click the Mail icon. The Mail dialog box is displayed. Click the E-mail Accounts tab, and then locate and select your Exchange account. Click the Change option, and then clear Use Cached Exchange Mode. Go to the More Settings option. Select the Advanced tab, and then click the Offline Folder File Settings option. Click the Disable Offline Use option, and then click Yes. Once again click the Offline Folder File Settings option. Click the Browse button to set the OST file location. Click the OK button. Click Yes to apply actions. In the Cached Exchange Mode Settings field, select Use Cached Exchange Mode. Click OK → Next → Finish. Press the Windows + R button, type regedit, and then press Enter. Navigate through the following registry path: HKEY_CURRENT_USER\Software\Microsoft\Office\version number\Outlook. Right-click the Outlook sub key, point to New, and then click the Expandable String Value option. Specify ForceOSTPath. Press the Enter key. Right-click the newly-created ForceOSTPath. Click the Modify option. Specify OST file path for saving in the Value box. Click the OK button. Entire OST file relocation sequence requires extreme precision and attention as any incorrect step would lead to OST email items corruption. During such procedures, if any kind of interruption happens, then the level of corruption couldn’t be tackled by manual troubleshooting procedures. Getting an intelligent and reliable third-party OST recovery application is a wise decision. 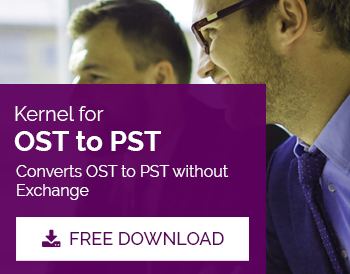 Kernel for OST to PST is an expert and trustworthy utility that aims to resolve severe corruptions of OST file and engineers the conversion of OST file to PST file. The software is upgraded with intuitive email migration alternatives which enables the establishment of direct connection to popular web-based email apps, email servers, and cloud accounts to store repaired email items. How to Locate Scan OST?